When practicing yoga we are often alerted to notice or modify our breath. Both, breathing too much or breathing too little, has far reaching effects on our systems. The article linked here explains in a concise manner what happens when we over-breathe or hyperventilate. 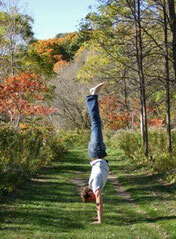 Alignment can make our practice easy, graceful and develop lasting integrative benefits. Question about alignment are plentiful. Adding to the thoughts and ideas shared during workshops and trainings, I wrote this linked article to contribute to more widely accessible references for yoga practice. Practicing makes perfect? Read in this article how our habits influence the effects of practice and what intelligent practice can do for your health. Find out how to be more comfortable entering urdhva dhanurasa using your breath. This article explains the anatomy and actions of the breath in back extensions along with practices. Viral epidemics, in particular the 'Swine Flu' in 2009, are generating large amounts of media attention. This link will connect you to a well researched and referenced article by Dr Russell Blaylock M.D. Be well informed to make sound decisions! Nutrition and Digestion: Is Vegetarianism appropriate? This is an article printed in ISSUES magazine in 2007. Some connections between nutrition and disease and the role of foods in the acid base balance of the body are described in this write up.